Guild S-100 Polara (left) and Guild S-200 Thunderbird. Guild S-200: Hans Moust. Guild S-100: William Ritter. Instrument courtesy of George Gruhn. Much like several other well-known manufacturers, Guild has, through the years, changed ownership, locations, and identities. 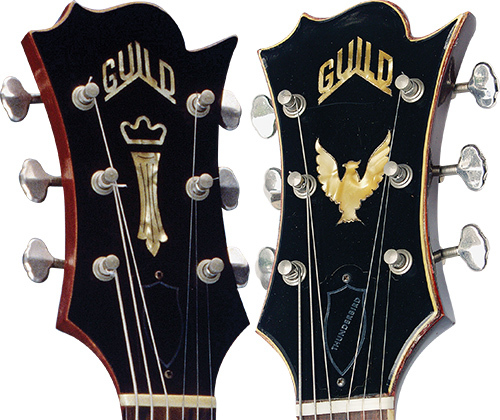 Guild was founded in 1952 by Alfred Dronge, a teacher and music-store owner in New York, and many of his first employees were former Epiphone workers hired after that company moved production to Philadelphia. Guild’s first guitars were shipped in ’53 and its early efforts concentrated on archtop acoustic and electric archtop hollowbodies with some features based on the Epiphone tradition, even as it introduced designs of its own. In ’54, it began to introduce flat-top acoustics as well as the innovative thin-hollowbody M-75. Early success motivated the company to move across the Hudson River to Hoboken, New Jersey, where it increased production. In 1966, Dronge sold Guild to an electronics company called Avnet, but stayed on as president until ’69, after which production was gradually moved from Hoboken to Westerly, Rhode Island. Dronge was killed when his private plane crashed in ’72, and the company was then led by Leon Tell, who had been its vice president since ’63. 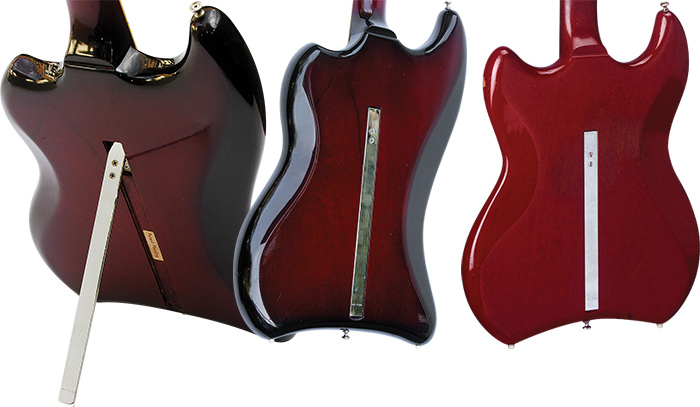 In the years since, Guild changed ownership several times, including to Fender in ’95, when production moved from Westerly to Corona, California, then later to Tacoma, Washington, and later yet to New Hartford, Connecticut. More recently, Fender sold Guild to Cordoba, which is manufacturing instruments overseas and building a factory in California. When not in use, the S-100/S-200 kickstand was tucked into a groove in the back and held in place with a magnet. 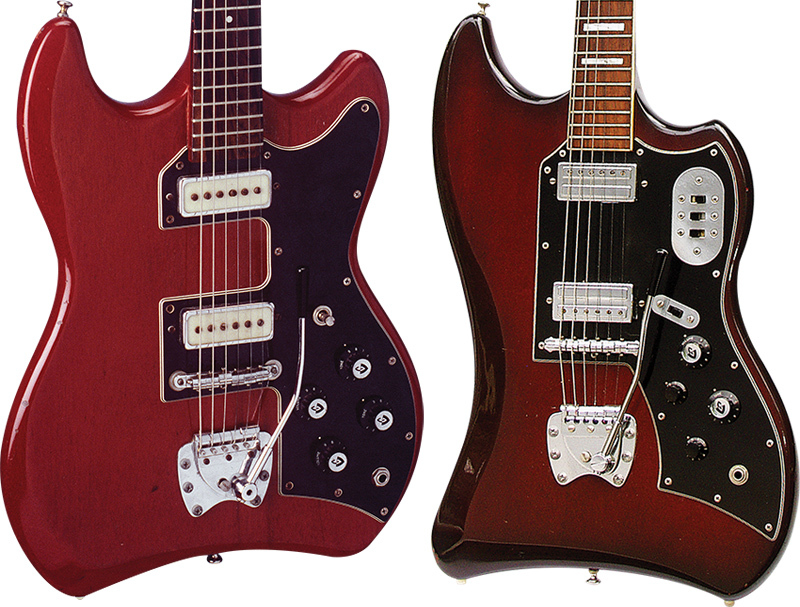 Though Guild’s initial focus was jazz players, it’s arguably better known for unique solidbody designs, which it introduced in ’63 with the S-50 Jet-Star, S-100 Polara, and S-200 Thunderbird, the latter two of which had a built-in stand consisting of a metal strip recessed in the body (and held in place with a magnet) and two small feet in the bottom of the body to protect its finish when standing upright. The top-of-the-line S-200 had an asymmetrical body made of mahogany or alder, a mahogany neck, bound rosewood fingerboard with pearloid-block inlays, bound asymmetrical peghead, and Hagstrom-made bridge and vibrato tailpiece. Early examples have an inlaid pearloid logo and bird on the peghead, and two humbucking pickups; specs later changed to a gold bird decal or “Chesterfield” inlay on the peghead and two single-coil pickups. The Thunderbird is outfitted with a toggle switch for pickup selection, two Volume controls, and two Tone controls, and, much like a Fender Jaguar, two pickup on/off switches and a Rhythm/Lead switch. The S-100 had the same built-in stand, mahogany or alder body, and mahogany neck, but its rosewood fingerboard had dot inlays and was unbound. It shared the Hagstrom-made bridge, vibrato tailpiece, and single-coil pickups. Early examples had an asymmetrical headstock with black peghead veneer with Guild and Chesterfield inlays, but in ’65, the peghead was given a natural finish with six-on-a-side tuners and silkscreened logo. The S-50 Jet-Star was a budget guitar described in the catalog as, “Guild quality from top to bottom… in an impressive solid body that identifies its owner as a musician who has equipped himself with an instrument of prestige.” It goes on to state the model is “recommended by teachers for student and other amateur use.” The S-50 does not have the built-in stand and was dressed with just one pickup and a combination bridge/tailpiece, with the Hagstrom vibrato as an option. The “kickstand” versions of the S-100 and S-200 were discontinued in 1970, when Guild redesigned its electric line; the S-100 was then given a body shape similar to a Gibson SG, while the S-200 simply disappeared from the product line. Since being discontinued, the S-200 has been seen in the hands of players including Muddy Waters, Zal Yanovsky (The Lovin’ Spoonful), Jeff McDonald (Redd Kross), and Dan Auerbach (Black Keys). However innovative and interesting Guild’s kickstand may be, its practicality has always been a point of concern, given its instability. Like other historically interesting pieces, it clearly was influenced more by its builder’s marketing department than by an instrument designer. And, from a collectibility standpoint, it’s likely that kickstand versions of the S-100 and S-200 are rarer today simply because more were damaged as a result of players using it instead of a proper stand! Headstocks on early Guild solidbodies had an asymmetrical shape, black veneer, and pearloid logo with “Chesterfield” inlay on the S-100, bird inlay on the S-200.